PRODUCT DESCRIPTION: Odorless dust, much like the consistency of baby powder, which is very active against a wide range of pests. Using phenethyl proplanate and pyrethrin as actives, this dust is quick to act and unscented. Treatments will last 60-90 days when made to hidden voids and spaces. TARGET PESTS: Ants, bedbugs, carpet beetles, centipedes, cockroaches, crickets, darkling beetles, earwigs, hide beetles, firebrats/silverfish, fleas, millipedes, sowbugs/pillbugs, spiders, scorpions, and other indoor/outdoor crawling pests. Also effective on wasps, yellow jackets and bees. WHERE TO USE IT: Like any dust, ECO DX is best used in attics, crawl spaces, wall voids and hidden areas out of sight and direct sunlight. RATE OF APPLICATION: 10 oz jar can treat up to 1000 sq/ft of area. 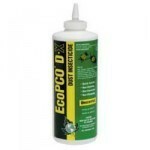 Apply every 6-12 months for maintenance; once every 3 months when insects are active and problems ongoing.